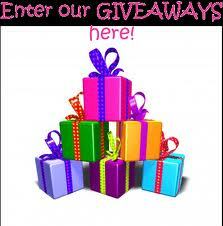 Feel free to link up all your giveaways here and enter a few too!! Share this post on TWITTER and FACEBOOK and anywhere else! Forgot to add.... Fan Giveaway ends at 1,200 fans! I'm at about 1,100 fans! Hi there! Thanks for visiting today! I'm glad to have found your blog and will definitely link up next time I have a giveaway (later this week)! Hello! I added my giveaways! Also followed thru GFC! Hi! Thank you for hosting! I follow you on gfc, twitter and FB. I really enjoy your blog! We're a group of volunteers and opening a brand new scheme in our community. Your web site provided us with valuable info to work on. You have done a formidable task and our whole community might be thankful to you. Hello, Neat post. There's a problem together with your web site in web explorer, could check this? IE still is the market leader and a large component to other folks will miss your great writing because of this problem.